It is the desire of every parent for their children to receive the best possible education. We even choose homes that are located in the finest school districts. Educational needs of our children, from infancy on, become paramount. Most families, like us, have not felt the need to investigate alternatives to the traditional school systems in which we grew up. One day, our vision of “school” changed when I had the opportunity to visit with a homeschooled child. Curious, I asked her what she thought about learning at home. This young girl pulled up a chair and began sharing her reasons. I was very impressed as she carried on an enlightening conversation. Most children her age would not have sought eye contact or shown interest in a discussion with an adult. She sparked my interest and touched my heart. I had to know more. We began an investigation by talking with homeschool families, reading any information we could find about it and attending our first Teacher Parent Association Workshop. Reading The Right Choice-Homeschooling by Chris Klicka confirmed what was in our hearts. For the next year I examined The Big Book of Home Learning Vol 2 – Preschool and Elementary by Mary Pride for our beginning curriculum. I made pages of notes, listing the pros and cons of each curriculum and then wrote for further information. I so desired to be the best teacher for Ethan and I thought I needed the “best curriculum,” too. When our oldest son Ethan turned 5, we felt it was the perfect time to begin learning numbers and letters. 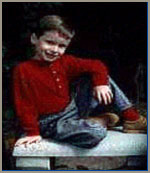 Since he had turned 2, he had shown an ability to speak fluently using language appropriate for a child much older. People in public would often comment on his speech and then ask, “How old is he?” They would say, “Oh, he is so smart.” What they didn’t always see was his inability to sit still with a mind switched on high, calling himself the “Eveready Bunny.” We were sure if he had gone to pre-school or began elementary school, that he would have been labeled Hyperactive with Attention Deficit Disorder. As we began our phonics and math lessons each day, we would look at the cards and repeat them. Soon, Ethan had them memorized, although he would consistently reverse letters and numbers. Relatives assured us that he would outgrow the reversing process by 3rd grade. I was not satisfied with that answer. What about the precious time between now and then? Back to the process at hand, we’d go on to new sets of cards and by the end of the week when I’d review the cards from the week before, he wouldn’t remember them. We would both become frustrated and angry, culminating with me asking my 5 year old, “Why don’t you remember?” We’d take a break, I’d ask for forgiveness and pray for greater patience and kindness, then begin again, fresh with new expectations. Ethan resisted our mornings of homeschooling and it seemed we often ended our battle’s with tears of confusion, regret, and guilt. Here was our precious little boy whom we’d dreamed about and prayed for while we struggled with infertility for seven years. I recalled the way God had brought his birth mother into our lives and the relationship we had developed with Ethan since birth. We indeed believed Ethan was a miracle for us. With all of our deep, intense feelings for him, we couldn’t understand why I couldn’t teach him effectively. Maybe we just needed to give him more time to mature and wait with the phonics and reading, recalling the philosophy of Dr. Raymond Moore. My own self-doubts began to emerge. I prayed daily that we might find an answer to our learning problems. Then in May 1995, I came upon an article in the C.H.E.C.K. (Christian Home Education Confederation of Kansas) News about a parent who faced many of the same problems as we did and the solution they had found through NACD (National Association for Child Development) based in Huntsville, Utah. After completing the articles I knew I’d found our help. I called to speak with the author and obtained phone numbers for NACD as well as a certified consultant living in Dallas, Texas. We immediately ordered the tape series by Robert J. Doman, Jr., Founder of NACD. The four audio tape series are Guide to Child Development and Education, Child Management, Learning Disabilities, and the Parent Teacher. As we listened, we began to receive valuable information as to how we could take specific steps to help Ethan learning more effectively. We also felt encouraged in our home learning endeavor as Mr. Doman indicated that parents are the best teachers for their children because the process can best be achieved one-on-one, we “know” our children and care passionately for their well-being, more than anyone else could. We could hardly wait for our initial evaluation and the opportunity to begin teaching Ethan more effectively so he could learn more efficiently. What we found interesting was that the whole child was evaluated: behavior (attitude); diet; sleeping patterns; word recognition; math; and dominance (auditory, visual, manual and foot). We obtained a great deal of information about mixed dominance and how the brain receives, processes and stores information. Ethan preferred his left hand to write, but would rather throw a ball with his right hand. He kicked with his left foot, but used his right eye and listened with his right ear predominantly. These simple differences allowed information that he saw and heard to be stored on the left side of his brain, as the information from his hand and foot activity was stored on the opposite side of the brain. In actuality, there was mixed dominance that made the brain’s processing of information (crossing from one hemisphere to the other) much slower, if not impossible to retrieve. One of our primary goals, even prior to reading or math, was to achieve neurological organization and primary side dominance of the brain. Ethan began wearing glasses with the right eye covered, a silicone plug in his right ear and total emphasis on using his left hand and foot. To encourage Ethan, I even began wearing glasses with my left eye covered, a silicone plug in my left ear and emphasis on using the right side of my body. My biggest change came in my usage of the telephone. I had always listened to the phone with my left ear so I could write with my right hand, so I changed that habit. At first the sound seemed far away with poor clarity, but within a few weeks, I began to prefer listening with my right ear. I believe that my involvement in learning dominance has helped Ethan to continue. The glasses and ear plug have become second nature to him. We have used these aides for the past seven months and look forward to Ethan’s next evaluation as to the progression of his left-side dominance. We soon realized the importance of Auditory and Visual Processing. How many numbers a person can remember when a series of numbers are read aloud to them, one second apart, is Auditory Processing. Normally, the number of digits remembered should match the individual’s age, up until age 7 or 8. Visual processing is determined by showing a card with digits printed on it for three seconds and observing how many digits can be remembered. Ethan’s initial Auditory Processing was 5 and Visual Processing 5. It has been more difficult for Ethan to practice and advance at Auditory Processing, especially if there are any distractions. In seven months, he has now advanced to 6 and 7 respectfully. Remember, every digit advancement represents one year of learning. Every day Ethan wears his glasses and ear plug. Five days a week, he performs approximately 18-20 activities with specific attention to the frequency, intensity and duration of each. The goal is for Ethan’s mind to be stimulated and for learning to be fun. One vital aspect of this type of learning is that we must supply Ethan with input before he can process it and give feedback. This is the most important, yet most difficult aspect to remember and perform, because it was opposite to the way I was taught. I read the information and formulated the answers in my mind, always ready for questions. I remember memorizing information specifically for testing and then subsequently forgetting it. I now find myself grieving for those lost years of optimal learning, especially now that I’ve learned about specific input for appropriate development. Although I cannot go back in time, I can now make a significant difference in my child’s learning process and I am grateful for that opportunity. I find great importance in following the prescribed activities (frequency, intensity and duration) as closely as possible. There have only been a few days of illness that have kept us from our weekly goal of 100%. Once we’ve become adjusted to our program, we usually accomplish it by noon, which leaves the afternoon free for further stories, explorations, play with his two year old brother, or time for the whole family. One of the greatest blessings has been the opportunity to keep our focus on Christ. We have learned to ask one another for forgiveness, to pray and read the Bible together. We have become more transparent with one another. There is great joy and satisfaction in witnessing the growth and development of children as well as the awesome responsibility to help them attain their greatest potential. We believe that with the specific input and advancement which NACD offers, we can achieve that goal. We are indeed thankful.